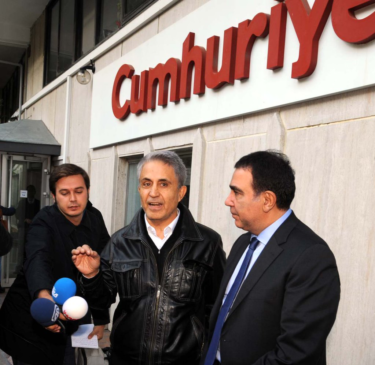 Cartoonist Musa Kart, interviewed by media before police questioning. Cartoon Movement is the internet’s leading platform for high quality political cartoons and comics journalism with over 400 contributors across every continent. “President Erdoğan has respondent to the recent so-called coup attempt by arresting hundreds of thousands of his fellow countrymen. 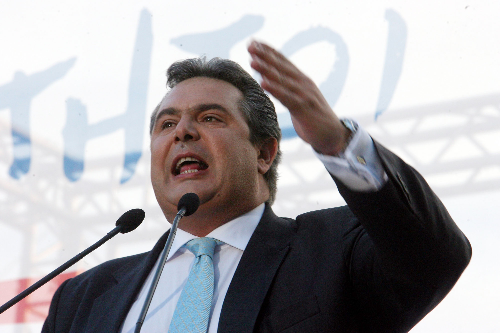 People from all walks of life, high ranking governmental officials, the cream of the judiciary, intellectuals of all persuasions, journalists, simple common working people and anyone else he thought had negative opinions about him have been arrested. Some witnesses have said that the entire affair made him extremely happy, as now has an excuse to get rid of all of his enemies. There still may be as many as 100,000 people imprisoned. 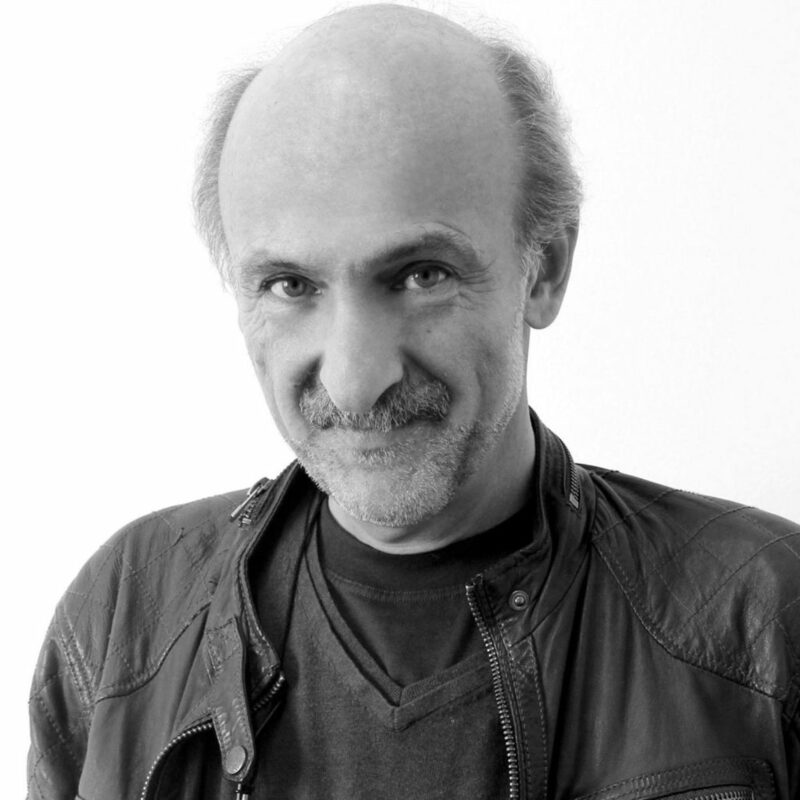 One of them is our friend and client, Musa Kart, a prominent cartoonist with the Cumhuriyet newspaper. He and a number of other staff members still languish in prison. 11/29/16 UPDATE: Zunar has written to supporters saying that the artwork from last weekend’s exhibition remains in police hands and that he must report back on December 27th for “further investigation”. In addition two organisers of the event have been questioned. 11/27/16 UPDATE: Zunar has been released. 11/27/16 UPDATE: Zunar’s Twitter feed states that he will be released from police custody today, 17:00 local time, 09:00 GMT. We await further news. 11/26/16 – Within 24 hours of reporting about the disruption of Zunar’s latest cartoon exhibition in Penang we were dismayed to hear of his arrest. Today (25th Nov 2016) I was forced to call off my exhibition in Penang, 4 hour drive north of Kuala Lumpur, Malaysia due to an attack by pro government thugs. I was verbally abused, physically attacked, and my artworks were vandalized. More than 30 thugs stormed into my newly launched exhibition in a public area. They were aggressive, hostile and abusive. Some of them assaulted me. I was fortunate that a few members of public came to my rescue. The few policemen who turned up were unable to control the thugs and they had to call in the anti riot unit. The thugs demanded that I take down the exhibition and some of them proceeded to destroy my artworks. So, to summarise: within one afternoon Zunar exhibited some political cartoons in a Penang shopping centre, was counter-protested and allegedly man-handled by a group from UMNO, police broke up the scrum, the cartoons were removed (or perhaps damaged), the event was cancelled and Zunar was arrested for “breach of the peace”. The supreme irony of the situation is that this arrest has been made under Section 4(1)(c) of the Sedition Act 1948, the very law to be challenged as unconstitutional buy Zunar and his lawyers in January. The UMNO official whose complaint to police apparently led to the arrest gives his account of Friday’s events here, a version that is disputed by a local councillor here. CRNI maintains as always that political cartoons constitute freedom of expression which is a fundamental human right as well as a legitimate, legal and entirely peaceful form of protest. We condemn this arrest unreservedly, the tenth time Zunar has been detained in this fashion. The story has also been picked up by our friends at Cartooning For Peace and United Sketches. In an interview with Free Malaysia Today he confirms that he has cancelled the show outright. 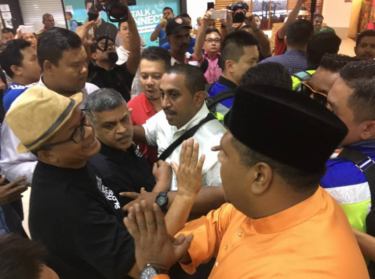 As readers of our blog know well, Zunar is currently prohibited from leaving Malaysia. A long time critic of Prime Minister Najib Razak, Zunar will formally challenge the legality of the state’s sedition act in January. If successful he will avoid a further trial for nine counts of sedition and a possible prison sentence of over forty years. Unable to travel elsewhere but determined to continue his cartooning career, speaking truth to power and facing a hostile regime, regrettable incidents like this one become more likely. 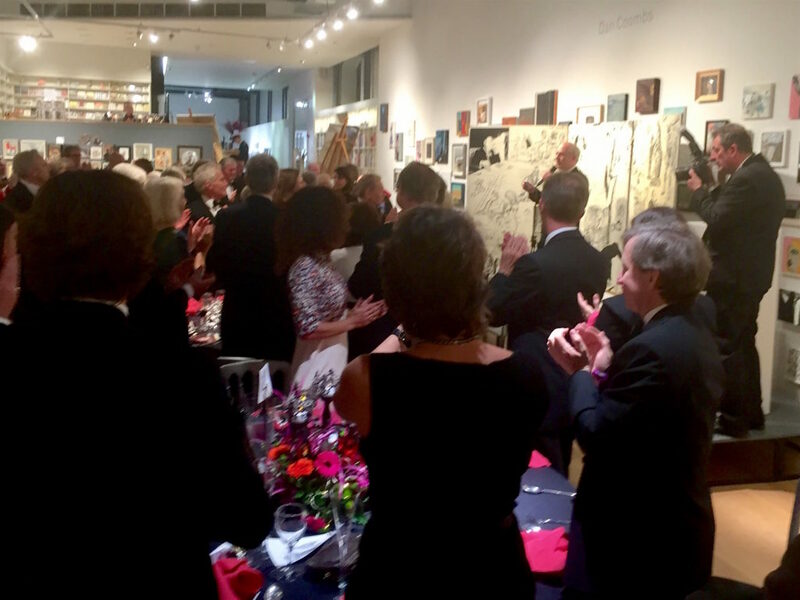 Last night the British Cartoonists’ Association and the Cartoon Museum held their annual awards and fundraising dinner at the Mall Galleries in Central London. 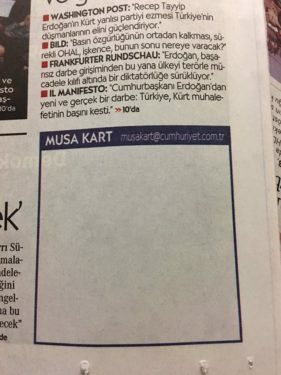 BCA chairman Martin Rowson is a long-time supporter of Musa Kart, political cartoonist for Turkey’s Cumhuriyet newspaper and one of several members of staff entering their fourth week of jail time in Silivri prison, Istanbul, awaiting trial for alleged collusion with the organisers of last summer’s attempted coup. After paying tribute to the cartoonists murdered in in the offices of Charlie Hebdo magazine in January 2015, Rowson told the audience of assembled cartoonists, politicians, journalists and cartoon fans about the plight of both Kart and Zunar, the Malaysian cartoonist currently facing trial for sedition. He then invited everyone to make a standing ovation for Musa Kart as an act of solidarity and support for the twin freedoms of speech and laughter. The audience included Britain’s top cartoonists, senior journalists from The Times, Daily Mail, Daily Telegraph and Private Eye, Britain’s leading satirical magazine, as well as the much-loved veteran comedian Barry Cryer, former Foreign Secretary Jack Straw, former London Mayor Ken Livingstone, multiple Oscar winning animator Richard Williams (the animator of Who Framed Roger Rabbit? 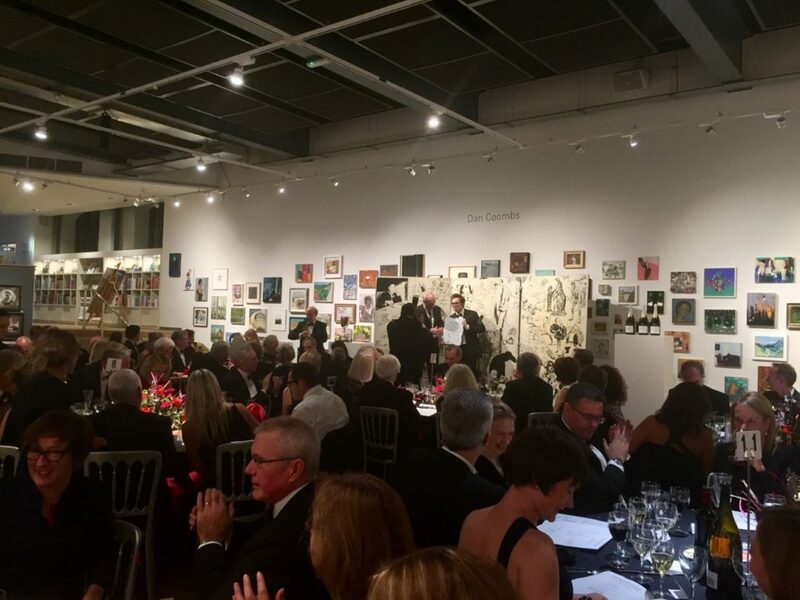 who received the Lifetime Achievement Award later in the evening) and former Cabinet Minister Lord Kenneth Baker, who is also vice-chairman of London’s Cartoon Museum and a fan and collector of political cartoons. We thank Martin Rowson for keeping Musa Kart and Zunar in mind during these ceremonies. If successful he will avoid facing prosecution for the nine counts of sedition the government are currently charging against him. Zunar remains under a travel ban. As we reported last month and many times over in the past, the Malaysian government is determined to disrupt if not terminate the career of this internationally respected cartoonist, whose primary subject is the corruption he contends exists in the administration of Prime Minister Najib Razak and the suppression of democratic freedoms in Malaysia. Like many in the country’s capital he was wearing yellow for last weekend’s “Bersih5” peaceful protests. 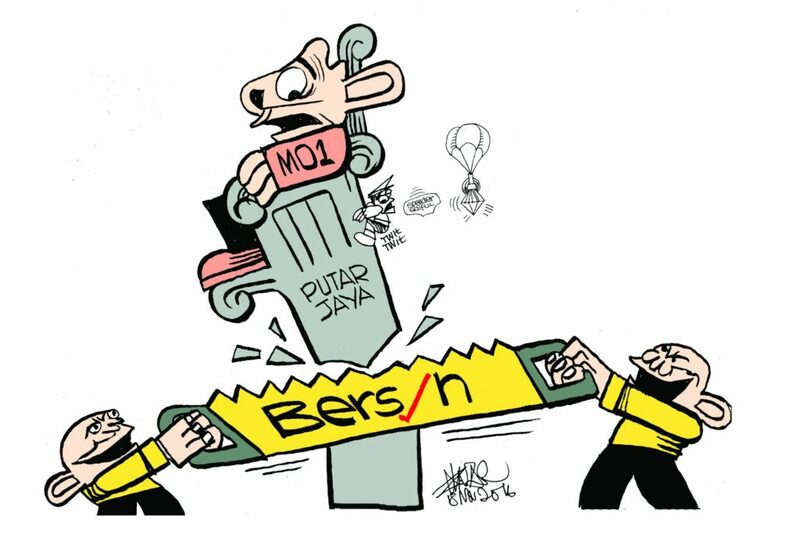 Cartoon by Zunar in support of Bersih5 protests. We wish Zunar and his lawyers every success early next year and sincerely hope this will put an end to his years of strife.